Dependability and efficiency is the lifeblood of any successful career. In an ideal world, individuals would be able to successfully estimate how long it should take to complete a task and then carry out the task in the allotted time. People are regularly either under or overestimating how long it will take to complete tasks at work. Both can be dangerous in a professional setting. While the inability to project an accurate time span for tasks won’t sink every career or company, it can make it significantly harder to achieve success. For this problem, like many others, the best defense is a good offence. And a good offence is arming yourself with knowledge about this unfortunate phenomenon. The ‘overestimating/underestimating timespan’ phenomenon was explained in 1979 by Daniel Kahneman and Amos Tversky. Kahneman and Amos coined the theory, The Planning Fallacy. When humans estimate the length of their own tasks, they tend to be fairly optimistic. When humans estimate how long a task will take others, they tend to be pessimistic. In most cases, the estimations are not affected by how long similar tasks had taken in the past. With the knowledge about The Planning Fallacy, individuals and businesses can work to weed out inaccurate time predictions that might be wreaking havoc on their image, their productivity, and their financial prospects. Chronic, or even occasional, lateness can be a career killer for general employees and unwise for managers. Failure to arrive at locations in a timely manner can lead to job termination for employees, the inability to effectively reprimand employees, and potential loss of client trust for managers. The problem with eliminating optimism bias from your commute time projections is that arriving on time is dependent on a dozen smaller factors. You will need to accurately predict how long your morning routine will take and how road conditions will affect your commute. This can be a hard task for the 89.4% of people that have an average commute of 25 minutes. The longer the commute, the more that can go wrong. To time yourself to get an accurate sense of how long your morning routine takes. Input the route into MapQuest or Google Maps for a more accurate sense of your commute length. (If you are making the trip during rush hour, you might need to wait to get a projection until right before you leave). Spend a few days timing your trip. Try to note how traffic lights, traffic, and stop signs affect the trips length. Don’t set your daily departure time for the best case scenario. Before you leave for the day, check if there are any accidents on your normal route. Optimism bias during job interviews can be a double edged sword. Job interviewers often give optimistic guestimates about how long tasks typically take. This might increase their chances of landing a job, but it can also give employers expectations for the individual that they can’t necessarily meet. This can be bad for both the interviewee and the interviewer. Depending on how far off the estimate is, the interviewee might lose the job down the line due to perceived professional dishonesty or due to the inability to meet job standards. The interviewer might eventually get reprimanded or fired depending on how many times they on-board ‘bad’ hires. Ask the current employees in the position (or the manager) what an acceptable time range is. Be a little skeptical. If the number is too good to be true, it might not be accurate. Keep an ear and eye out for any hesitance or second guessing. Ask questions that dig deeper into the individuals workflow. Be confident about the number you choose. Don’t verbally second guess yourself. Give a range of projected times based on different relevant factors. (Personal distraction is not a relevant factor). Ask a friend or former colleague to estimate how fast you are for the completed tasks in the past. A freelancers or businesses success often hinges partially on projecting how fast the individual or company will be able to complete the project they propose to potential clients. Vastly incorrect time projections in your bid (especially if you go over the allotted projected time) can lead to massive problems. Clients can feel cheated or tricked into hiring you to complete the project. Depending on how bad your projection was off, the client might refuse to allow you to complete the project, refuse to work with you again, leave a bad review online, or refuse to pay you. Evaluate past projects. How fast were you able to work? Did you have any problems? Consider, in the beginning, giving a time range rather than a set time. If you need less time, you’ll work less time. Overestimate a little. If you think you can complete the task in 2 hours, tell them to expect the job to be done in 3 hours. For individuals working in management, a vital aspect of your job duties is to set employee productivity standards. Due to the fact that many managers set project and task timelines with a pessimism bias, it can be easy to give employees too much time to complete tasks. While some employees will be honest about the far too light workload, others will pretend that they are far busier than they are in an effort to escape more work. Instead of a culture of high performers, slow company growth, the inability to meet deadlines, and the potential loss of frustrated high performers. If you set the bar low, continually push employees to be more productive. Keep an eye out for signs that employees are spending large portions of their day slacking. Keep an eye out for employees who are far exceeding their colleagues. It might be a fluke, but it might be a sign that the bar is too low. Encourage high performers and time saving innovations. Have high performers train new employees, to potentially prevent them from being told not to be too efficient. 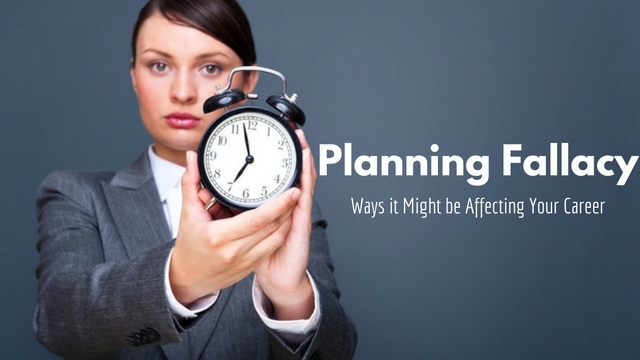 Everyone is affected by The Planning Fallacy. In order to succeed, individuals (whether they are managers, freelancers, or employees) should evaluate how optimism or pessimism bias might be affecting their work flow. Having a more accurate sense of how fast you can accomplish tasks can prevent problems and grant you more agency over your professional life.